Mangaluru, Apr 29, 2017: 2017, annual catholic community celebration of weddings is set for May 1 at the Rosario Cathedral, Mangalore, under the auspices of the society of St Vincent de Paul, Rosario Cathedral. Objectives of community celebration of weddings is to help young men and women from lesser privileged economic backgrounds to marry with dignity and solemnity at minimal cost. 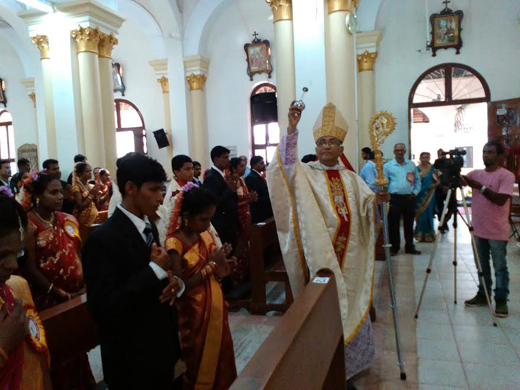 Most Rev Aloysius Paul D’Souza, Bishop of Mangaluru will be the main celebrant for the ceremony. This is the 43rd year of celebration of community weddings and so far over a thousand couples have joined in holy matrimony. 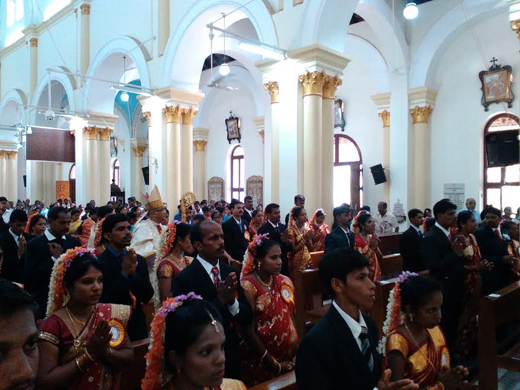 This year, there are 19 couples from various parts of the diocese of Mangaluru and other parts of Karnataka who will tie the knot. Around 2,000 guests are expected to participate in the celebration. Apart from the wedding ceremony and the dinner, organizers are giving each couple a pair of wedding rings along with dress materials and household articles. John D Silva, doyen of Cooperative Bank of Mumbai, will be the Chief Guest. The Society of St. Vincent De Paul, of Rosario Cathedral, established in 1926 has been holding this mega service since 1975, with the help of philanthropists and generous donors. Pictures attached are from our files representing 2016 celebration.